The pink splotches indicate IgA, a type of antibody that is important for limiting bacterial incursion into the intestine. The levels of IgA increase in mice with a deficient intestinal barrier. New research could clarify how inflammatory bowel diseases (IBD's), conditions that include ulcerative colitis and Crohn’s disease, are triggered and develop. Scientists at Emory University School of Medicine have shown how the immune system can compensate for a "leaky gut" and prevent disease in mice that are susceptible to intestinal inflammation. These findings could explain why some individuals who are susceptible to developing IBD do or do not get the disease. The results were published online Sept. 13, 2012 in the journal Immunity. "Our results suggest that when there is a chronically leaky intestine, defects in the immune system need to be present for the development of IBD," says senior author Charles Parkos, MD, PhD, professor of Pathology and laboratory medicine at Emory University School of Medicine. "Breakdown of the intestinal barrier can occur as a result of intestinal infections or stress. The normal response involves several components of the immune system that help to heal the injury while controlling invading bacteria. When this normal response is defective and there is a leaky barrier, the risk of developing IBD is increased." Parkos and co-senior author Tim Denning, PhD, assistant professor of pediatrics, and their colleagues have been studying mice that are deficient in a protein called JAM-A (junctional adhesion molecule A). JAM-A is an important regulator of the epithelial barrier in the intestine. Denning describes JAM-A and other "tight junction" molecules as forming a seal between epithelial cells like a zipper, which keeps bacteria away from the rest of the body. JAM-A deficient mice have a "leaky gut," meaning that chemicals and bacteria can cross more easily from the insides of the intestines to the rest of the body. Passage of bacteria across the intestinal wall and into the body can cause inflammation and disease. JAM-A deficient mice have more bacteria in the liver and lymph nodes, and they are more susceptible than regular mice to a chemical treatment (DSS) that induces colitis (intestinal inflammation). 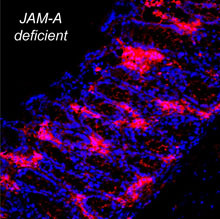 Surprisingly, despite these defects, JAM-A deficient mice do not develop spontaneous colitis. "This is a situation that may be analogous to first degree relatives of people with Crohn’s disease," Parkos says. "Some of these people have increased intestinal permeability, which suggests that they are more susceptible to developing disease, but they don’t get sick. Gut permeability also transiently increases in normal people based on what we eat and drink, yet disease doesn’t occur. We think that immune compensation is what protects the body under these conditions." The researchers wanted to dissect which types of immune cells were responsible for this compensatory effect. To this end, they treated JAM-A deficient mice with antibodies that depleted certain types of immune cells or, in some cases, examined mice with additional genetic changes in combination with the JAM-A deficiency. They found that a type of immune cell, CD4+ T cells, is needed to produce signals that encourage production of a type of antibody, IgA. IgA is especially important for limiting incursions by bacteria in the intestine. "In normal mice, immune cells such as CD4+ T cells and IgA-producing B cells do not play a big role in DSS-triggered colitis," Denning says. "But if the mice have a preexisting leak, the immune system plays an important role." Under normal conditions, B cells are needed to produce IgA, which helps to keep bacteria from invading through the intestinal wall. While defects in the production of IgA alone do not result in colitis, the presence of a chronically leaky gut in concert with IgA deficiency results in increased susceptibility to abnormal intestinal inflammation that involves other types of immune cells. During intestinal inflammation, the amount of JAM-A in the epithelium can decrease, thus further weakening the intestinal barrier. "There is a 'chicken or the egg' question with respect to whether inflammation or alterations in the intestinal barrier come first," Parkos says. "Many people with IBD report that their first severe episode was brought on by a stressful event or an intestinal illness, and it is possible that these events serve as a trigger that starts a vicious cycle of altered barrier and inflammation." The research was supported by the National Institute of Diabetes and Digestive and Kidney Diseases (DK061379, DK72564, DK055679, DK59888, DK064399), the National Institute on Alcohol Abuse and Alcoholism (AA017870) and the National Institute of Allergy and Infectious Diseases (AI083554) and the Crohn’s and Colitis Foundation of America. Reference: M. Khounlotham et al. Compromised intestinal epithelial barrier induces adaptive immune compensation that protects from colitis. Immunity 31, 1-11 (2012).